The last weekend in June we had some friends as well as Caleb's sister and her husband visit us. We had a great weekend, spending the day strolling the farmer's market and lounging by the pool, and spending the evenings chatting and watching our friend Jonathan do magic tricks (he's really good!). Our brother-in-law seriously loves pudding, and since I wanted to serve a good Southern dessert, I knew I had to make banana pudding. 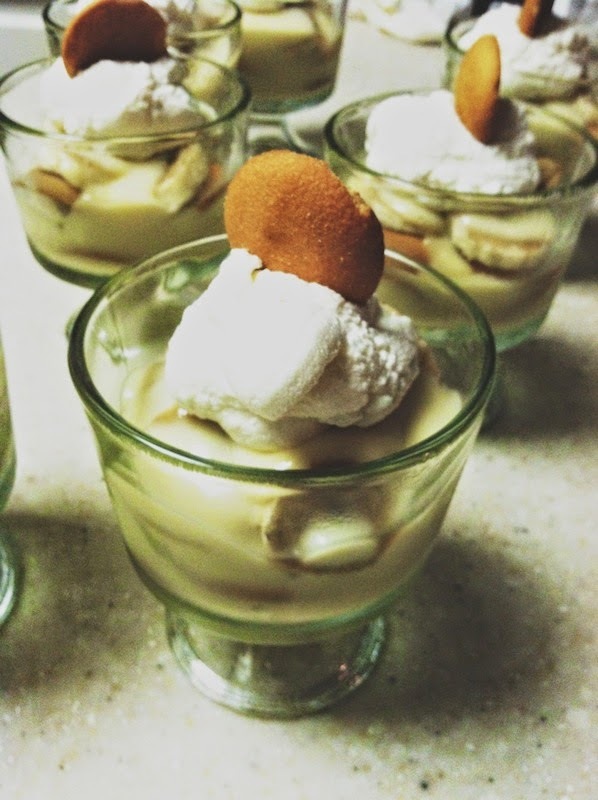 Banana pudding is one of those desserts that I absolutely love, but never think to make. I had seen this recipe on one of my favorite foodie blogs so I knew it would be a trusty recipe, and I wasn't disappointed. In a medium saucepan, combine the flour, sugar, and salt. Whisk in the egg yolks, then the milk. Place the saucepan over medium heat. Add in 2 Tbsp of the butter. Cook, whisking frequently, until the mixture bubbles and thickens significantly. Remove from the heat. (You can strain through a mesh sieve if you are at all concerned about having overcooked it to remove any lumps.) Whisk in the vanilla and remaining 1 Tbsp of butter. Layer a serving dish or individual serving dishes with vanilla wafers and banana slices. Fill each dish with some of the pudding and continue layering with vanilla wafers and banana slices as desired until the serving dishes are mostly filled and the pudding has been used up. Cover with plastic wrap and let chill until well set, at least 2-3 hours. In the bowl of a stand mixer fitted with the whisk attachment, whip the cream and confectioners' sugar on medium-high speed until stiff peaks form. Blend in the vanilla. Transfer the whipped cream to a pastry bag and pipe a dollop of cream onto each serving of pudding. Garnish with additional vanilla wafers, if desired. Serves 8. The banana pudding was delicious! We loved spending time with you! Oh these look delicious! I can't wait to try this recipe! Thank you for sharing it Sherri!